John Oliver and Andy Zaltzman, the transatlantic region’s leading bi-continental satirical double-act, leave no hot potato unbuttered in their worldwide-hit weekly topical comedy show. Andy is joined by Helen to look at a few stories of human endeavor, including: creation of the MAMMOPHANT, beauty spot stag do’s and traffic lights versus Darwin. What are we doing to prolong humankind? Not much AND too much. Andy is joined by Wyatt Cenac to look at the latest developments either side of the Atlantic, plus Fidel Castro and buckets of gold. Podcast: The Bugle: Bugle 4002 – Where’s MY Knighthood? 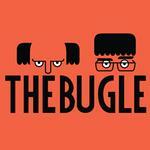 Podcast: The Bugle: Bugle 285 - Where's Bono?